With Intel’s announcement in early 2013 that they would be halting mini-ITX motherboard production, companies that adopted Intel’s Marshalltown board found themselves scrambling to fill the void, or worse, needing to quickly restandardize around another board. Since Intel had planned a 3 year lifecycle for the DN2800MT Marshalltown, many companies were looking forward to a relatively long deployment of its slim profile, impressive I/O offering, and favorable price point. Instead, they had a significant pain point when the board went EOL in less than two years and faced the prospect of having to go through the lengthy process of obtaining UL, CE and other certifications–all over again. Logic Supply began carrying the Mitac PD11TI as a successor to the DN2800MT Marshalltown board. EOL problem solved! The only notable difference to most was a different logo at the boot screen — and a much longer life cycle. Happy clients! Additionally, like the Intel motherboards, Mitac’s new products carry CE, FCC and UL certifications, helping to alleviate regulatory and safety concerns for customers transitioning from the discontinued Intel boards. 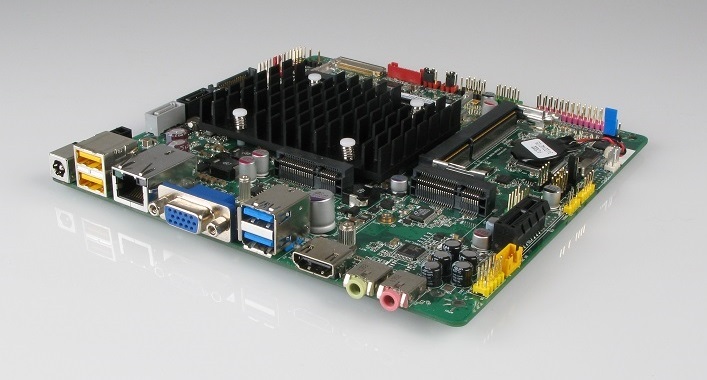 In even better news, and new for Q2 ’14, Mitac has introduced the PD10BI motherboard. This new offering is intended to function as an upgraded, extended life cycle replacement option for the DN2800MT. With only a slight increase in thermal design point (TDP), the PD10BI provides a significant boost in processing power, 64-bit OS and Windows 8 support with the inclusion of a quad-core Intel Bay Trail J1900 Celeron processor, a major step up from the DN2800MT’s Cedarview CPU, yet keeping the robust feature set. The included low-profile I/O features two USB 3.0 ports, two USB 2.0 high current ports, VGA, HDMI and LAN. The Thin Mini-ITX footprint provides dual PCIe Mini Card expansion slots, one of which doubles as an mSATA slot able to accommodate low profile, solid state storage. In keeping with its tradition of creating rugged systems for harsh environments, Logic Supply has developed a fanless chassis around the PD10BI for clients that wish to leverage its power and I/O set, yet need a solution capable of withstanding dusty environs. The ML210G-10 is now available on the Logic Supply website for early adopters of this brawny little industrial microcomputer.